The theme of IEEE GLOBECOM 2005 is Discovery: Past and Future. IEEE GLOBECOM 2005 features a diverse and exciting technical program, with results of research and innovation from an international collection of engineers in industry, government, and academia. These papers, posters, tutorials, workshops, and panels were selected for quality by members of the IEEE Communications Society Technical Committees. IEEE GLOBECOM 2005 has three illustrious plenary speakers; they, too, span industry, academia, and a government research lab. We are also continuing the very successful Design & Developers Forum and we have expanded the Telecom Business Forum to a three-day format, one entire day of the TBF is dedicated to Military Communications. There are also several social events, so that you can meet colleagues in a more relaxed setting. St. Louis is the perfect venue for our theme of discovery; it is known as the Gateway to the West and there is much to discover here. I hope that you will take some time to explore our wonderful host city, which offers a vast spectrum of dining, music, sports, and sightseeing. I would like to take this opportunity to thank all involved for their efforts in preparing our exciting program: the authors and invited speakers, the Technical Program Committee, our generous patrons, the St. Louis Convention and Visitors Commission, and, of course, our hard-working IEEE GLOBECOM 2005 Executive Committee. if you have any questions or need assistance, please call on us. 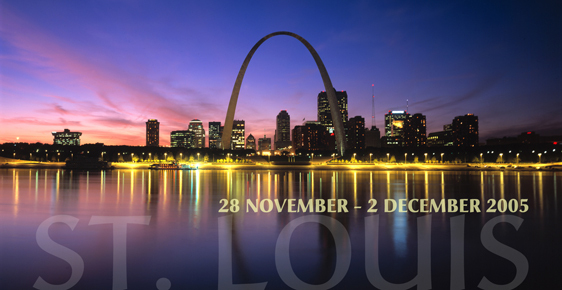 Welcome to IEEE GLOBECOM 2005 and to Saint Louis!